A pelican is any of several very large water birds with a distinctive pouch under the beak belonging to the bird family Pelecanidae. Along with the darters, cormorants, gannets, boobies, frigatebirds, and tropicbirds, they make up the order Pelecaniformes. Like other birds in that group, pelicans have all four toes webbed (they are totipalmate). Pelicans use two different ways to feed. Group fishing is used by white pelicans all over the world. They will form a line to chase schools of small fish into shallow water, and then simply scoop them up. Large fish are caught with the bill-tip, and then tossed up in the air to be caught and slid into the gullet head first. Plunge-diving is used almost exclusively by the American brown pelican; only rarely by white pelicans like the Peruvian pelican of the western South American coast or the Australian pelican. Pelicans males can be a little larger than females and have a longer bill. From the fossil record, it is known that pelicans have been around for over 40 million years. Modern pelicans are found on all continents except Antarctica; they are birds of inland and coastal waters and are absent from polar regions, the deep ocean, oceanic islands and inland South America. Pelicans are gregarious and nest colonially, the male bringing the material, the female heaping it up to form a simple structure. Pairs are monogamous for a single season but the pair bond extends only to the nesting area. Away from the nest mates are independent. The brown pelican (Pelecanus occidentalis) is the smallest (42"-54") member of the seven species of the pelican family. It lives strictly on coasts from Washington and Cape Cod to the mouth of the Amazon River. Some immature birds may stray to inland freshwater lakes. After nesting, North American birds move further north along the coasts in flocks, returning to warmer waters for winter. This bird is distinguished from the American white pelican by its brown body and its habit of diving for fish from the air, as opposed to co-operative fishing from the surface. It dines mostly on herring-like fish. Groups of these birds often travel in single file, flying low over the water's surface. The nest location varies from a simple scrape on the ground on an island to a bulky stick nest in a low tree. These birds nest in colonies, usually on islands. Pesticides like DDT and dieldrin threatened its future in the southeast United States and California in the early 1970s. Pesticides also threatened the pelican population in Florida in this time period. DDT caused the pelican eggshells to be overly-thin and incapable of supporting the embryo to maturity. As a result, DDT usage was eliminated in Florida and the rest of the country. The Peruvian pelican (Pelecanus thagus) lives on the west coast of South America, from Lobos de Tierra Island in Peru to Pupuya Islet in Chile. These birds are dark in color with a white stripe from the top of the bill, up to the crown and down the sides of the neck. They have long tufted feathers on the top of their heads. The main breeding season occurs from September to March. Clutch size is usually two or three eggs. Eggs are incubated for approximately 4 to 5 weeks, with the rearing period lasting about 3 months. This bird feeds on several fish species, showing a strong preference for Peruvian anchovies. It feeds by plunge-diving, like its close relative the brown pelican. The American white pelican (Pelecanus erythrorhynchos) is a very large (50"–70") white bird with black wing tips and an enormous orange bill. They are graceful in flight, moving their wings in slow powerful strokes. Unlike the brown pelican, the American white pelican does not dive for its food. Instead it practices cooperative fishing. Each bird eats more than 4 pounds of fish a day, mostly carp, chubs, shiners, yellow perch, catfish and jackfish. White pelicans nest in colonies of several hundred pairs on islands in remote brackish and freshwater lakes of inland North America. The female lays 2 or 3 eggs in a shallow depression on the ground. Both parents incubate. They winter in central California and along the Pacific coast of Guatemala; also along the shores of the Gulf of Mexico. Shooting by poachers is the largest known cause of mortality. Colonies are sensitive to disturbance and visits by humans can cause the pelicans to leave and abandon their nests. This species is protected by the Migratory Bird Treaty of 1972. The white pelican (Pelecanus onocrotalus) breeds from southeastern Europe through Asia in swamps and shallow lakes. The tree nest is a crude heap of vegetation. This is a large pelican. It differs from the dalmatian pelican by its pure white, rather than greyish-white, plumage; a bare pink facial patch around the eye and pinkish legs. Immature birds are grey and have dark flight feathers. More than 50% of white pelicans breed in the Danube Delta. This pelican migrates short distances, wintering in northeast Africa. In flight, it is an elegant soaring bird, with the neck held back like a heron's. Pelicans catch fish in their huge bill pouches, most while swimming at the surface. Like the dalmatian pelican, this species has declined greatly through habitat loss and persecution. The dalmatian pelican (Pelecanus crispus) is a member of the pelican family. It breeds from southeastern Europe through Asia to China in swamps and shallow lakes. The nest is a crude heap of vegetation. This is a large pelican. It differs from the white pelican in that it has curly nape feathers, grey legs and greyish-white (rather than pure white plumage). It has a red lower mandible in the breeding season. Immatures are grey and lack the pink facial patch of immature white pelicans. The latter also has darker flight feathers. This pelican migrates short distances. In flight, it is an elegant soaring bird, with the flock moving in synchrony. The neck is held back like a heron's. Like the white pelican, this species has declined greatly through habitat loss and persecution. The pink-backed pelican (Pelecanus rufescens) is a resident breeder in Africa, southern Arabia and Madagascar in swamps and shallow lakes. The nest is a large heap of sticks, into which 2-3 large white eggs are laid. The chicks feed by plunging their heads deep into the adult’s pouch and taking the partially digested, regurgitated fish. This is a small pelican. It is much smaller and duller than the great white pelican. The plumage is grey and white, with a pink back. The top of the bill is yellow and the pouch is usually greyish. Breeding adults have long feather plumes on the head. Food is usually fish and amphibians and is usually obtained by fishing in groups. The spot-billed pelican (Pelecanus philippensis) breeds in southern Asia from India to Indonesia. It is a bird of large inland and coastal waters, especially shallow lakes. The nest is a heap of vegetation in a tree. 3-4 eggs is the usual clutch size. This is a small pelican. It is mainly white, with a grey crest, hind neck and tail. In breeding plumage, there is a pink tone to the rump and underwings. Non-breeders are off-white in these areas, and immature birds are more extensively brown. As the species' name implies, there are grey spots on the pink bill in the breeding season. Spot-billed pelican is a sedentary resident with local movements and is distributed more widely in the non-breeding season. Like most other pelicans, it catches fish in its huge bill pouch while swimming at the surface. The Australian pelican or goolayyalibee (Pelecanus conspicillatus) is an unmistakable large water bird, widespread on the inland and coastal waters of Australia and New Guinea, also in Fiji, parts of Indonesia and as a vagrant to New Zealand. 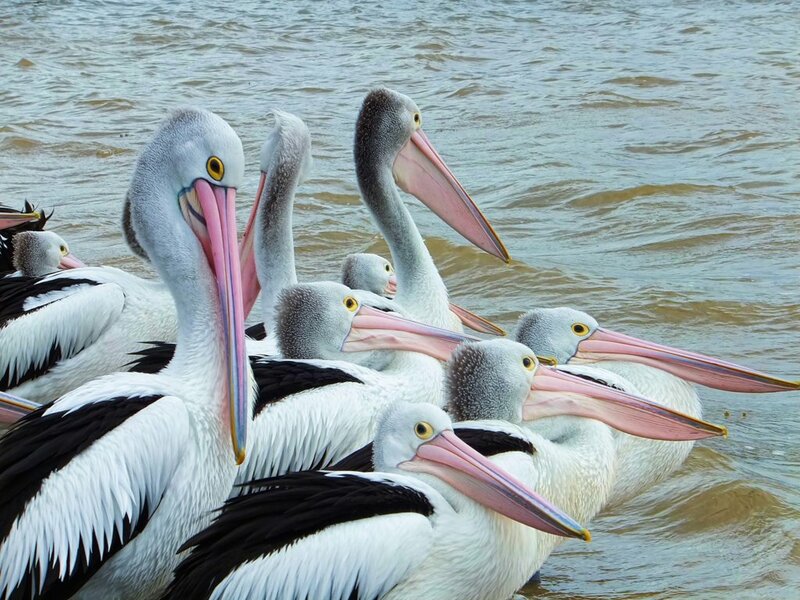 Australian pelicans are medium-sized by pelican standards. They are predominantly white, with black and white wings and a pale, pinkish bill. Australian pelicans prefer large expanses of open water without too much aquatic vegetation. The surrounding environment is unimportant: it can be forest, grassland, desert, estuarine mudflats, an ornamental city park, or industrial wasteland, provided only that there is open water able to support a sufficient supply of fish. Australian pelicans follow no particular schedule of regular movement, simply following the availability of food supplies. When the normally barren Lake Eyre filled during 1974 to '76, for example, only a handful of pelicans remained around the coastal cities: when the great inland lakes dried again, the population dispersed once more, flocks of thousands being seen on the northern coasts and some individuals reaching Christmas Island, Palau and New Zealand. The greatest threats to pelicans are habitat loss, hunting, human interference with nesting activities, persecution, poisoning from insecticides and industrial pollutants, pollution, oil spills and fishing injuries.